Dried beans: This variety is called Good Mother Stallard. It’s a very pretty maroon-and-white heirloom bean that’s known for being an amazing soup bean. As Matt says, the beans are so meaty and hearty that he thinks of them as tasty little meatballs in a soup! Winter squash: This is a big chunk of a Sweet Meat squash. These are so HUGE that we wanted to cut a few up into a manageable amount for each family. 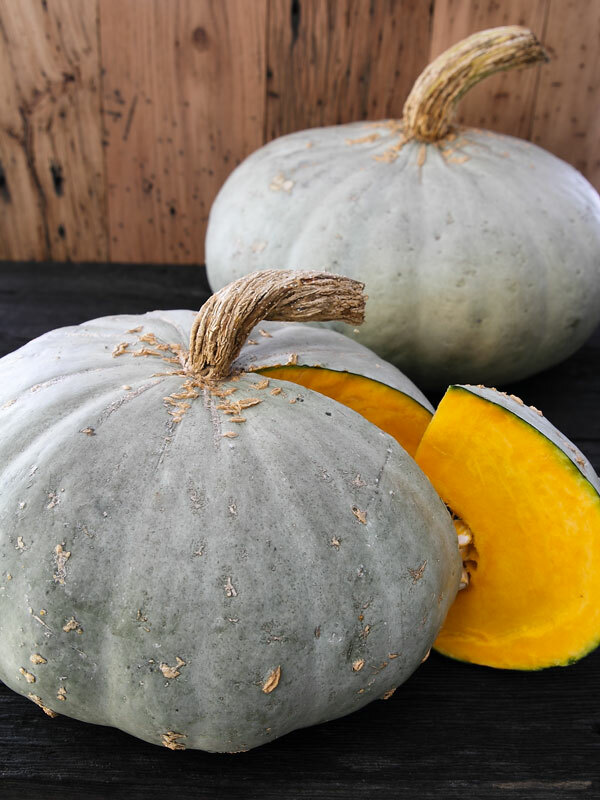 Bake this squash for out-of-this-world flavor and sweetness with a creamy, buttery texture. Can be used in pies, muffins, eaten as a side, or in many other dishes. Here are more ideas. Brussels sprouts: OK, if you love Brussels sprouts, great! (Me too!) But if you think you don’t love them, one reason why might be that you’ve had them steamed and overcooked, which makes them mushy with an off taste. Instead, try them roasted with garlic, salt and pepper. Or, try this (one of my favorite recipes): Cut all sprouts in half. Then, in a big bowl, whisk together a couple of tablespoons of olive with a couple of tablespoons of pure maple syrup. Toss in the sprouts and mix really well. Add to a roasting pan, and bake on about 375 for 15 minutes or so. While those are roasting, fry up a few strips of bacon, let cool, and break the bacon into tiny chunks. Pull the roasting pan out of the oven, toss the bacon bits with the sprouts, and put back in the oven for another 10 minutes or so, until they’re nice and colored. Then eat! These Maple Bacon Brussels Sprouts are simple and incredibly delicious. Garlic: This is our Silver Rose variety, which is our very best storage variety. If you don’t need it right away, it will last months in a cool, dry place and retain its awesome flavor.